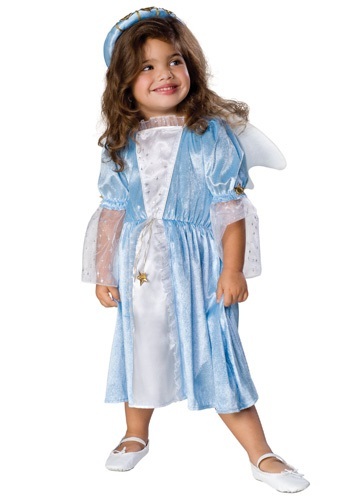 Transform your toddler into a perfect angel in this beautiful blue costume. The toddler angel costume features a dress, wings, and halo headband. The dress is made of blue velour with a center panel made of polyester and lined with ruffles that have silver star detailing. 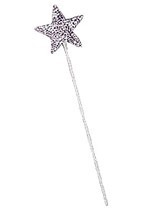 The elastic waist has gold trimmed ribbon with a golden star hanging from it. The sleeves also have elastic half way down and gold star accents. 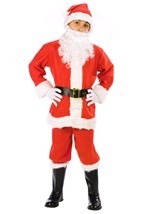 A slit in the sleeve sheers makes it easy for your toddler to play all night in this costume dress. The dress closes up the back with Velcro and has Velcro on the outside of the dress to attach the white angel wings to. A blue halo headband with more gold stars and stripes complete the toddler angel costume.